Learn about our popular Pergola tent and how it can be used to create stunning themed Bars, Lounges, Entrances, Buffets, and more. Double Pergola, Quadruple Pergola, Long Dining Tent etc. 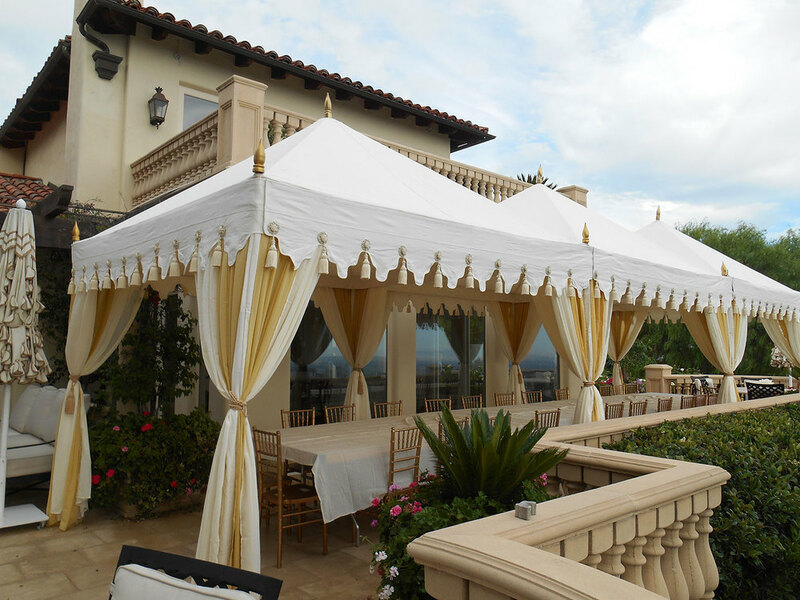 Raj Tents' Pergola Tent is our smallest and most versatile luxury tent rental. It is also our most popular tent as it can be put to many uses and comes in many great styles. The Pergola sets up on paved surfaces or inside as it does not require staking. It comes on a heavy stainless steel frame that gives it solidity and mass. The Pergola luxury tent transforms an environment with color and elevation, they are the perfect way to create focal points and to frame bars, buffets and lounges. The Pergola tents work well singly, in pairs - for a larger 10' x 20' footprint, in longer rows or as Quadruple Pergolas, where 4 tents are set up together to form a very interesting 25' x 25' square with open center. Check the gallery below for Pergola outdoor tent rental and small wedding reception ideas.